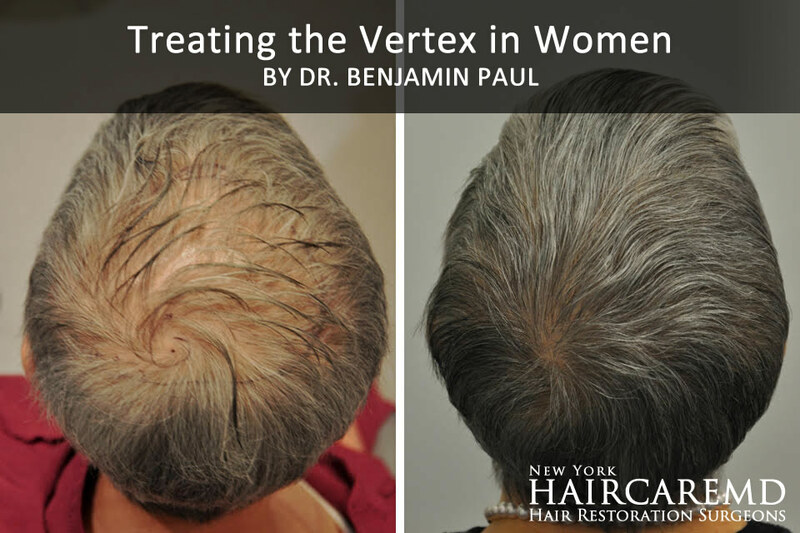 The vertex is the spot on the back of head where the vertical scalp meets the horizontal scalp. The vertex tends to have a whorl that spins clockwise in 95% of patients. Traditionally, this is the location where men get a "bald spot". There has been little written about the female experience with vertex thinning. Though patient's come to our office to address concerns about their hair, we examine each face carefully and individually during each consultation. On this week’s podcast episode 88 you will meet Dr. Benjamin Paul and really experience the passion he has for helping others. Dr. Paul is featured as a leading expert in facial plastics and hair restoration. PRP is platelet rich plasma. PRP is a solution is rich in growth factors and under the correct circumstance, PRP may be used to grow hair. PRP is made by drawing blood from the patient during and office visit. A hair transplant involves moving hair from the donor site in the back of the head to the recipient site, which is a region of thinning.On the day of the transplant, the donor hair follicle is inserted with a short hair shaft. This donor hair will grow from 3 weeks to 3 months (or possibly longer) and then shed. Not all the donor hairs will shed on the same day. There is a special group of shampoos that contain an anti-fungal known as ketoconazole. As an antifungal agent, ketoconazole is effective for the treatment of seborrheic dermatitis and general "dandruff". There is now strong research showing this topical likely helps with genetic (androgenic) hair loss as well in both men and women. Can Shampoo Help with Hair Loss? Platelets contain growth factors. These growth factors are concentrated and injected into regions of thinning and shedding on the scalp. The procedure has no downtime and is well tolerated. Our technique of FUE involves using a proprietary hybrid microdrill to extract just the core components of the follicle. The normal skin is able to heal rapidly. Even at one week, patients are well on their way to healed. For a variety of reasons, women may ask to have a lower hairline. Like all things, there is an art to achieving a natural result when lowering the hairline. For both men and women. the goal is to achieve facial harmony and balance, and the hairline is an important frame for the face. Every face can be divided into horizontal thirds. The art of lowering the female hairline? At HairCareMD, a hair transplant involves moving hair from the back of the head (the donor site) to an area of thinning or loss (the recipient site). Since the donor hair grows for life, the result of a hair transplant is a permanent enhancement. Transplanting the beard and side-burns. A modern single follicle hair transplant has the capacity to go beyond restoring the hairline and improving scalp hair density. The surgeons at HairCareMD can artfully fill patchy loss and shape the side-burns, eyebrows, and beard. What is a follicular unit? How does we use the variations on follicular units to our advantage during a hair transplant? The follicular unit is the fundamental unit from which hair grows. The unit contains a hair shaft, a muscle (the arrector pili – the muscle that makes hair “stand on edge”) and a sebaceous gland. The unit contains 1, 2, 3 or 4 hairs. As we age, there are certain changes that may occur. In 80% of men and 40% of women, visible hair loss may be present. Of all the treatments that exist, only a hair transplant represents a lasting and permanent solution for hair thinning. In the case of the hairline, recession is common in men and uncommon in women. With a properly planned hair transplant, the hairline can be reinforced in a mature location that is appropriate for the coming years and decades. Female hair loss has not received the attention it deserves, though over 40% of women will experience visible hair loss over a lifetime. The spectrum of female hair loss ranges from a loss of density to a widened part. How can a microscope help evaluate hair loss? When it comes to hair loss, the scalp contains a lot of valuable information. There are many potential underlying causes for hair loss and each have a specific pattern of change to not only the scalp but also the follicle and the pore from which the follicle emerges. Click below to learn more. Why do bald spots happen on the head and what can be done about them? There are three main reasons for bald spots. The first reason for a bald spot is the loss of hair associated with pattern baldness, known as androgenic alopecia. The type of baldness in men involves a bald spot in the back of the head. Click below to learn more. Recovery from hair transplant is easier than most patients anticipate. The goal of recovery is to help ensure that every hair and follicle transplanted survives and that donor site heals beautifully. What is the difference between FUT vs FUE? A hair transplant involves taking hair from one place on the body (often the back of the head) and transferring the hair to a new location (recipient site). Common questions for Platelet Rich Plasma (PRP) for hair loss? Platelets circulate in the plasma component of your blood and contain valuable growth-factors. These growth factors can be concentrated and used to grow hair. What you need to know about Female Hair Loss? Female hair loss has NOT received the attention it deserves. Mistakenly thought to be a strictly male disease, women actually make up 40% of American hair loss sufferers. Hair loss in women can be absolutely devastating for the sufferer's self-image and emotional well-being. Though there are some similarities, female and male hair loss are distinct entities with different patterns of hair loss.